What you want, I daresay, is a big, poufy skirt! I wore a black net petticoat the other day to the museum lecture of a photographer. It was a boughten one, from Sock Dreams. At the lecture, I wore it with boots, a knit top, a windowpane plaid scarf, and a striped wool skirt. Last January, in London, I wore it over tights, without a skirt, because in London a girl can dress that way, and that's why I love London. California loves a bare midriff, but they still don't know what to make of under wear as outer wear; it's sad and conformist really, but there isn't much of a dialog about the politics of exposure in women's wear right now. 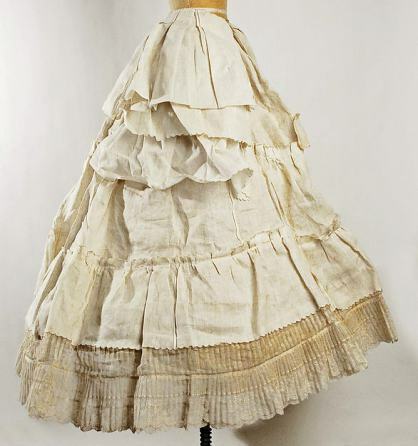 Here is a little history of the crinoline as the successor to the petticoat. The terms are used a bit indiscriminately nowadays. Because the crinoline was named for the stiff horsehair fabric of the same name, I call my stiffer underskirts crinolines and the softer ones petticoats. I made a nice petticoat of silk and vintage lace from this fine pattern for a crinoline, from Gertie's Blog for Better Sewing. Voluminous, 100 yard, square dance petticoats can be found on Ebay, or Petticoat Junction, and another place to buy underskirts of varying pouf, is Unique Vintage.